Aren't there just times when you wish you had this sign on a stick or something and you could just whip it out in someone's face when you KNOW that the words coming out of their mouth are complete BULLSHEEYT. I got this sign at a negotiating workshop this past week. We were all given one and if we heard anyone negotiating some BULL then we just put up the sign as if to say "STOP THE MADNESS - YOU LIE LIKE A RUG." It was a blast. 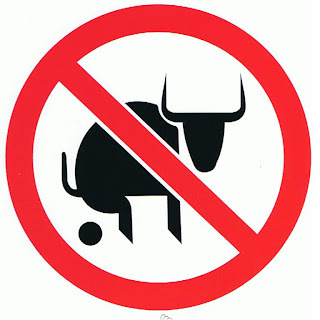 I have mine on my fridge as a reminder to my kids that MOMMY ain't hearin' no bull. Anybody got some examples of where they would use this sign?